In the summer of 2016, I invited myself and some other Canadians along on an Icelandic pilgrimage that has recently been instituted. It was an adventure! Here is a short introduction to the pilgrimage – with thanks to our Icelandic hosts! Have a look at what we’ve been doing in our department at Concordia Montreal’s Theological Studies! Last weekend Matthew Anderson, an assistant professor in Concordia’s Department of Theological Studies and the Loyola College for Diversity and Sustainability, and Sara Terreault, a lecturer in the Department of Theological Studies, led a group of students on a walking pilgrimage from Old Montreal to the Kahnawake Mohawk Territory. From Saturday through Monday, they toured churches and First Nations institutions, learning about the people and the cultures they represent. Anderson compiled this account. Plotting a 34-kilometre walking route between Old Montreal and the Kahnawake Mohawk Territory was difficult. But the hardest part turned out to be the last few kilometres. Sara Terreault, a lecturer in Theological Studies, and I were temporarily stymied at city hall in Sainte-Catherine, a city near Kahnawake on Montreal’s South Shore. Only a couple of minutes later, we discovered a service road footpath connecting the communities along the river. The problem is clearly not impassible terrain, but something else. Maps of the town end at the border and show a blank space to the west, where Kahnawake lies. When there is a blockade or a political crisis, this benign ignorance on the part of many non-Indigenous Montrealers can turn into outright suspicion or hostility, as clearly happened during the so-called Oka Crisis of 1990. What’s the solution to such a conundrum? Part of it may begin with simply putting one foot in front of the other. Students move between two destinations — and two cultural realities. In a study I’m presenting in July at the Sacred Journeys conference at Mansfield College, Oxford, I propose that the dynamics of a trek offer a unique way to bridge cultural differences. Our research shows that walking combats ignorance of the cultural “other” not only in the shared experience of the journey, but also by allowing us to feel in our own bodies the distance from — and proximity to — these supposedly foreign places. This is an experience that travelling by motor vehicle just doesn’t offer. This summer, Terreault is teaching a course on pilgrimages in the Department of Theological Studies. Along with me, she organized the 34-kilometre walk from Old Montreal and Kahnawake, which we undertook this past weekend. To test how walking pilgrimages change the cultural suppositions of those who undertake them, she required her students to critically engage with pilgrimage theories during their trek between the historic destinations. 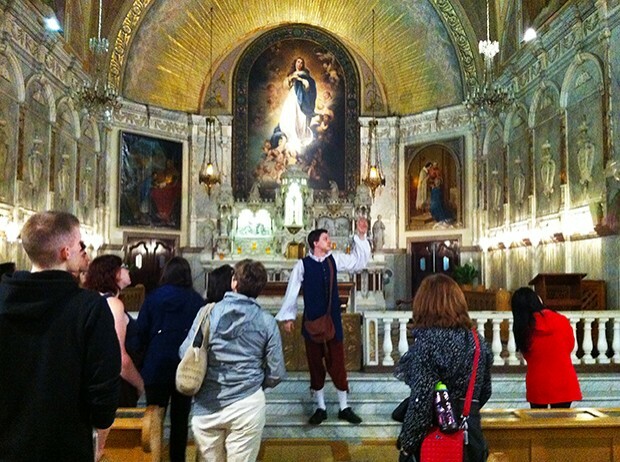 Participants tour Old Montreal’s Notre-Dame-de-Bon-Secours Chapel, once a popular site for Christian pilgrims. The walk began on Saturday morning, with a tour of Old Montreal’s iconic 17th-century Notre-Dame-de-Bon-Secours Chapel, a structure built at the behest of St. Marguerite Bourgeoys that served as a pilgrimage site for the first Christian inhabitants of what was then called Ville-Marie. From there, we walked the 23 or so kilometres to Sainte-Catherine, where we stayed in the basement of Église Sainte-Catherine d’Alexandrie. Early the next morning, we began the roughly 10-kilometre trek to Kahnawake. While there, we visited the shrine of Kateri Tekakwitha, who became the first Indigenous North American saint with her canonization in 2012. We learned more about Tekakwitha from Orenda Boucher (BA 09, MA 13), who is working on a PhD thesis on Mohawk spiritual expressions. Later, we toured the Kahnawake Cultural Centre with Tom Deer, its cultural liaison officer, before we ended our time in the territory with a visit to the Kahnawake Longhouse, a place for traditional religious expression. We also had the privilege of spending some time with Kenneth Deer, a Kahnawake journalist and educator who is involved with the United Nations Permanent Forum on Indigenous Issues. Our pilgrimage concluded on Monday with our walk back to Montreal. Terreault was moved by the entire weekend. Ultimately, the voyage we undertook was not so much to a destination as between two cultural self-understandings and the physical spaces that exemplify them. It’s important to note that the walk was part of Concordia’s ongoing mandate of public outreach. 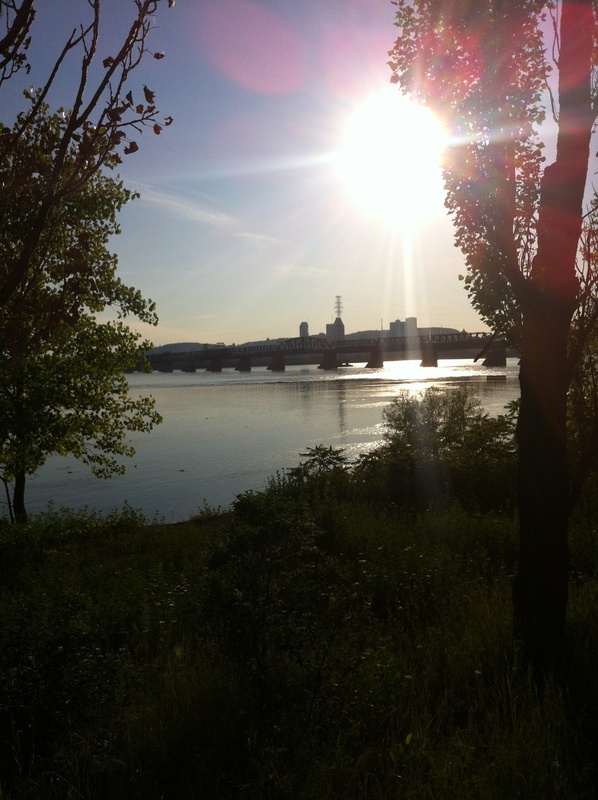 On our journey, we crossed densely urban, suburban and industrial zones, as well as parks and recreational areas, rediscovering parts of what was once an important historical Montreal trail. But as much as we were retracing the past, our eyes were definitely on this route’s future. Our political leaders, including those of the First Nations communities, are asking us to learn from each other. Walking is a singularly powerful way to begin to do exactly that. Since it wasn’t rush hour and the span over the St-Lawrence was clear, it took only twenty minutes to drive from my home in Verdun to where the steelwork and concrete delivered the little rent-by-the-hour Toyota containing my friend Sara and me into the Mohawk territory of Kahnawake (Kahnawà:ke). I’ve always found there to be something almost harsh about the Mercier Bridge. Despite being of similar construction it has none of the 19th century charm of the Victoria (a bridge my children used to call the “singing bridge” when they were little, for the hum of the tires on the steel tracks slung along its sides). Nor does the Mercier attempt the modernist concrete vision that first inspired and then doomed the grandly arching Champlain, finished in 1967 and already on life support. Where the Jacques Cartier Bridge meanders genteelly over roller coasters and parks, the Mercier seems more grimly pedestrian, even though actual pedestrians would be risking their lives to walk it. Maybe it’s the way one is forced to drive the Montreal approach to the Mercier, encased in a graffiti-covered cement chute that twists and turns through barely glimpsed walls of duplexes until the roadway finally shoots you up and onto the steel. It’s really only as you near the bridge’s end that you realize how high you’ve come. And then, just as the Seaway glitters below you, you drop down the exit ramp to the erroneously named “south shore”, the car’s shocks pinging at potholes. Suddenly you’re in a land you didn’t realize was there, a strip of gas stations, restaurants, smoke shops and road-side businesses with signs in a language that seems to have too many consonants, apostrophes and syllables to make sense. This is not your land, you think. And you’re right. The Mercier Bridge’s greatest shortcoming might be that, on a good day, it delivers you too quickly from one world to the next. From the thick stone walls of the centuries-old Roman Catholic mission among the Iroquois, through the Mohawk steel workers who were first trained on the bridge spans and went to American cities for work, through Indian residential schools and the riots and blockades and soldiers and warriors of the late summer and fall of 1990, there are stories to be told about every foot of the transition between shore-lines. When traffic is light the stories flit by like the shadows between girders, far too quickly even to be heard, much less really heard, which is to say, to be felt and understood. 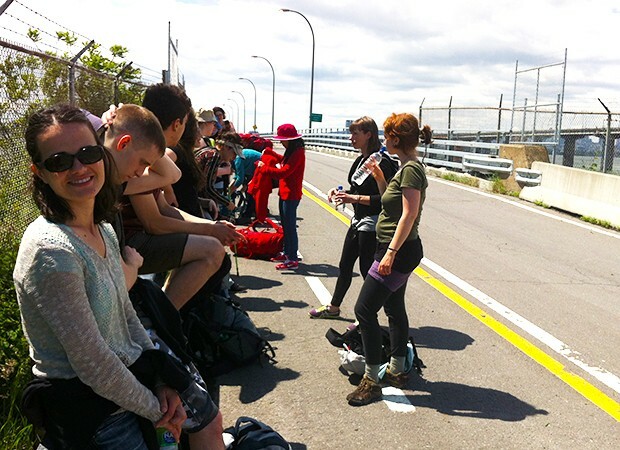 In June Sara and I will be leading a group of walking pilgrims from Old Montreal to Kahnawake as part of the pilgrimage class we’ve developed at the Department of Theological Studies, Concordia University. Each year the students have had to walk a pilgrimage. While in the past we’ve focused on European routes, this year we’re sticking closer to home. 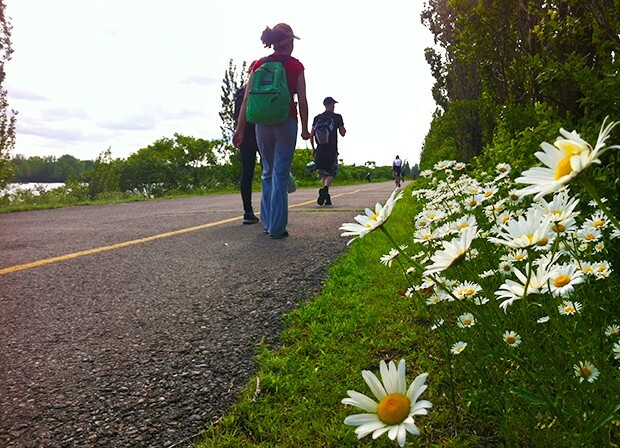 In June we will walk the 30 km or so one-way route together. 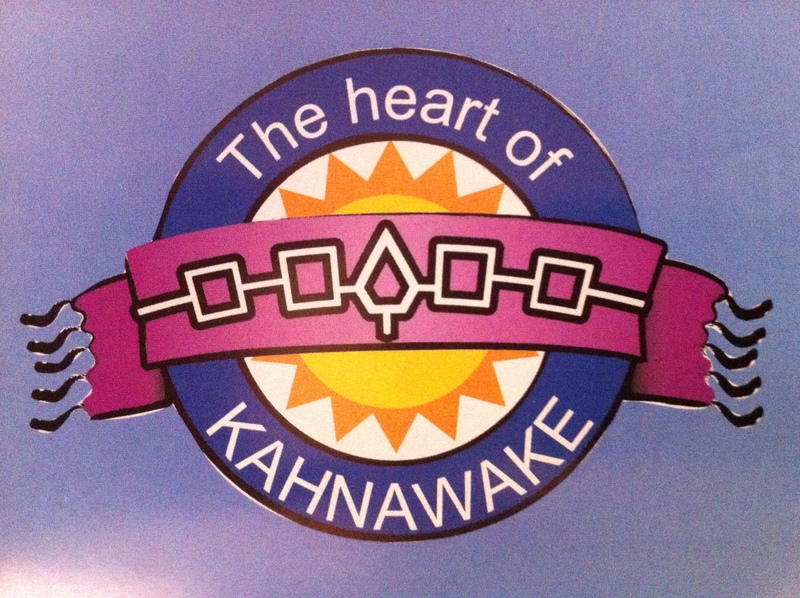 Although we are starting in the Old Port it won’t be a pilgrimage to Kahnawake (although such a pilgrimage does exist, centred on the shrine of the Mohawk Saint Kateri). Instead we hope our June walk will be an experiencing of the full distance – cultural, temporal, linguistic, historical, and spiritual – between two poles: Old Montreal, one of the hearts of Champlain’s dream of French settlement in this part of North America, now a gentrified example of Quebecois North American culture, and Kahnawake, a territory of the Mohawk, part of the historic Haudenosaunee Confederacy. Each end of this walk has its own understandings of, and traditions around, journey. We hope that by taking our time along the distance between those understandings and experiences of mobility this summer, the stories will unfold at a pace we can hear as well. This summer we hope that we too will learn, together and footfall by footfall, where we are going, and how to get there.